There have been three life-altering moments in the life of Paul Pope. The first was the death of his father in 1988. The second was the birth of his first child. And the third came in 2001, when he made a pilgrimage to a place few people have ever heard of, a tiny Italian hamlet called Pasquarielli, inland from Naples. He went to Pasquarielli because he was researching a book about his father, National Enquirer founder Generoso Pope Jr., and his grandfather, Generoso Pope Sr. Pasquarielli was the town where his grandfather was born, and from which he emigrated in 1906. That day in 2001, the population of Pasquarielli, all 200 of them, turned out as if it was a feast day to welcome the prodigal grandson home. It was by far the most crucial event in the researching of the book and the closing of the circle. He could see why his grandfather left, but, for the first time, he could also see where the emotional ferocity of the Pope family came from. With time out for both good and bad behavior, not to mention family squabbles ascending to knock-down-drag-out dysfunction, Paul Pope has been working on The Deeds of My Fathers for 14 years. After amassing 600 interviews and a mountain of research, at long last he’s published a book that may have started as a vanity project but has emerged as considerably more than that — a family saga about the Italian-American experience, a story of the building of a tabloid empire, and a search for an unknowable father by a confused son. “I started out figuring I’d do maybe 50 interviews,” says Pope, a 43-year-old man in a business suit who talks very fast — not to convince you of the truth of what he’s saying but because the stories and the ideas tumble over themselves trying to get out. And there was something else about the time in Pasquarielli that was startling for him: it was entirely different from his own family experience. 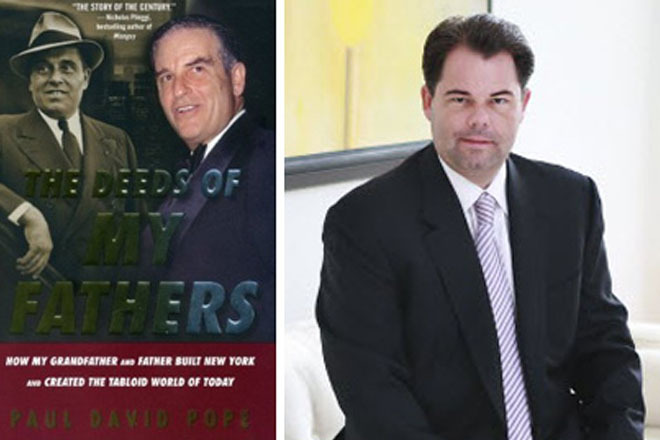 Generoso Pope Jr., Paul’s father, bought the New York Enquirer in 1951 with the help of a $25,000 loan from Frank Costello, the head of what would become the Genovese crime family. Generoso – his friends called him Gene – was looking for an outlet because his father had just died, and his mother and brothers had pushed him out of the prosperous family media business that included a newspaper and radio stations. The loan came without interest, but Gene Pope had to agree to two things: not to print anything about organized crime, and to cover nightclubs and performers that Costello and his friends owned in great, appreciative detail. It seemed like a good deal, and so it proved to be, even though Costello had to supplement the original loan with envelopes full of cash for some time. The New York Enquirer was a moribund weekly; within 15 years, Gene Pope had converted it into The National Enquirer. After passing through a gleeful mortuary phase, with pictures of decapitated heads and burned corpses, Pope gradually found the perfect tabloid balance for the latter part of the 20th century: a high-calorie count of celebrity gossip and scandal salted with lots of uplift. “It was the Reader’s Digest on Mars,” writes his son. In time, the paper amassed a circulation of 6 million, with a cash stash of $50 million, but Gene Pope never seemed to derive much fun from it, for he was close to anhedonic — incapable of experiencing pleasure. Pope married Lois, his third wife, in 1965, just as the Enquirer was really taking off. They had two children: Paul and Lorraine, who was born with Down syndrome. Paul says that there was no question in anybody’s mind that Lorraine was always her father’s favorite, and that was fine with Paul. He loved Lorraine too. Lois Pope, Paul’s mother and now one of Palm Beach County’s most noted philanthropists, observed her boy and came to some conclusions. Once Gene Pope relocated the Enquirer to Lantana in 1971, he created his own world, eliminating anything that upset him. Paul tells about his dad growing restless over a Lantana traffic light that stayed red too long. He called the city, and the light’s timing was promptly changed. In time, Paul worked everywhere at the Enquirer, from the loading dock to editorial. He says that his father regarded him as the heir apparent, yet at the same time Gene Pope kept his emotional distance, just as he did with everybody else. The elder Pope hated to be away from the office, hated to take vacations. He bought his clothes from Sears, drove a Chevy, always ate a cheese sandwich for lunch. He was famous for Friday afternoon firings. Paul worked at the Enquirer, and he also worked at Pope’s wacky offshoot, the Weekly World News. As you might expect, the latter was a lot more fun, because the Gene Pope his son describes was a creature of obsessive habit. “He would come home between five and six every night, unless there was a breaking story. He would have chicken soup, pasta al dente, then he’d go over story suggestions. He’d watch M*A*S*H or some other show. And that was it. Then he’d do it all over again the next day. I only remember one book on his nightstand, a book about Henry Ford. Gene Pope clearly had a profound case of a padrone’s sensibility, and he was also a hard-core newspaperman; he once told his son the roar of a printing press sounded like Puccini. According to Pope’s will, the paper was to be sold to the highest bidder. His son put a bid together with the help of Shearson Lehman; he went as high as $400 million, but was outbid by an offer of $412.5 million. The upside was that Paul Pope, not to mention the rest of the family, were all very rich; the downside was that his life had no obvious purpose. What he calls “The War of the Popes,” refers to a nearly homicidal legal war that developed between Paul and his mother, Lois, that was ostensibly about money and the size of his inheritance, but not really. He takes a good part of the responsibility himself. The actual event that brought an end to the War of the Popes was the serious illness of Lorraine, Pope’s sister, who contracted pneumonia four years ago. When Lois Pope found out her daughter was deathly ill, she didn’t know what to do about notifying her son, so she called her lawyer. He told her not to call Paul. If the Pope family has righted itself, the Pope heritage has fallen on hard times. There’s a sense that the National Enquirer after Gene Pope was like Disney after Disney – a terrible period of drift. Disney righted itself, but the Enquirer hasn’t. Would his father have been able to avoid the gradual erosion of the tabloid market that recently resulted in the AMI bankruptcy? “I admire what David Pecker has done,” says Paul of the Enquirer‘s owner. “They’ve continued to do checkbook journalism better than anybody else. John Edwards’ love child? My father would have loved that story. Personally, Paul has come to what he believes is a more centered place in his life. He has three children by three different women, none of whom he married. Lois Pope says that The Deeds of My Fathers “captures the man I knew,” although she says she “kind of hurried” through what she refers to as “the bad parts.